Tuesday, September 16, 2014 at 12:46 am. 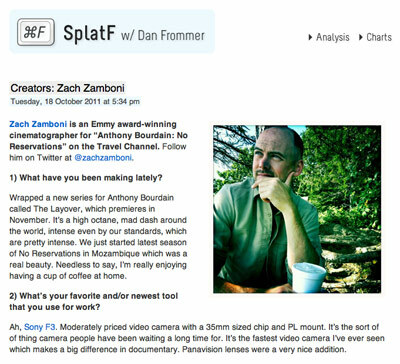 From mid-2011 through early 2014, SplatF was my tech news and analysis site. I started the site as an experiment in self-publishing, and it quickly became a full-time effort. I gradually published less, focusing on other projects. The “Creators” series interviews with Chank Diesel, Richard Turley, Zach Zamboni, Adam Lisagor, Susan Kare, and others. Over the three years it existed, SplatF received almost 4 million pageviews from 2 million people. Not bad, but not great. The best months, of course, were the ones when I spent the most time on it. But a few big links here and there played a big role, too. Why Does Apple Announce iPhone Pricing and Availability but Other Phone Makers Don’t?